Yamaha reset the entry-level sportbike equation when it first launched the R15. 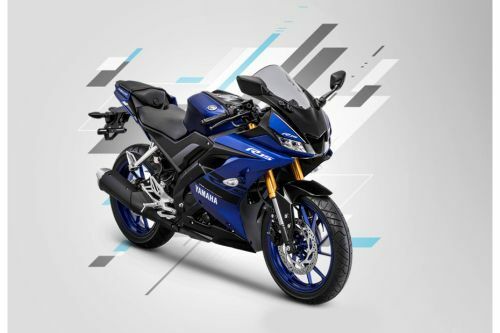 The bike soon gained enough popularity for Yamaha to have introduced the third version of the bike in 2018. The newest version now improves upon the existing formula of the deltabox chassis with competent suspension, sporty styling, and riding posture and a stonking engine to provide one of the best riding experiences at its price point. Available for Php RM 11988, the R15 comes with a 155cc liquid-cooled and fuel injected engine with VVA to produce 19 hp and 14.7 Nm of torque. Transmission is six-speed with an assist and slipper clutch. Also included in the package are digital instrumentation, LED lighting, USD front suspension but no ABS. Even without the ABS, the Yamaha R15 packs in enough of a punch to satisfy even the most demanding racer at this price point. Have a question on YZF-R15? YZF-R15 is available in 3 different colors - Blue, Yellow and Black. Yamaha launched the new for 2018 YZF R15 near the end of July this year. The R15 has become the hallmark of small capacity performance and the gateway bike for motorcycling enthusiasts all over Asia. Especially in India and Indonesia. Yamaha has also kept the name alive through three generations now and the current generation showcases what constant evolution can achieve. Thoroughly enhanced with features like VVA and slipper clutch, the Yamaha YZF R15 promises to be an even better bike than it already was. Priced at RM 11988 at the time of its launch, it faces off against the KTM Duke 200 and the Modenas Pulsar RS200. The crazy superbike like fully faired styling has always been one of the biggest draws for the Yamaha YZF R15. The newest R1 inspired instalment does not disappoint either. The front end is inspired by the M1 Moto GP bike and features a central intake with slim LED headlights on both sides. Above it is a large and aerodynamic windshield. Between them are aerodynamically shaped rear view mirrors. The tank looks muscular and chiselled. The gills in the front of the tank make it look menacing. The side view is surprisingly bereft of aggressive slashes and vents and yet is unmistakably Yamaha. A large angled low mounted muffler carries the lines of the bike very well. The rear subframe is beefy. The racy tail section and the seat are clearly inspired from the R1. The tail section is a hollow piece that is see through from one end to the other. The tail section might be a work of art but the seat on top of it is nigh on useless. There are no grab rails either. The single piece taillight also cuts a pretty figure from the rear. The only criticism is drawn by the indicators mounted on stalks that look very much like an afterthought. There are three colors to choose from – blue, black and yellow. The R15 gets a new fully digital LCD display. The information is well laid out and easy to read. There is even a welcome screen that can be customized by the rider. Taking a page from the handbook of more serious motorcycles, it comes with a gear position indicator and a shift indicator light for optimum gear shifting. The bike has compact and well-proportioned dimensions of 1990 mm (L) X 725 mm (W) X 1135 mm (H) with a wheelbase of 1325 mm. There is 170 mm of ground clearance. 17-inch Y spoke alloys wheels with wide 100/80 front and 140/70 rear tires round out the bike’s appearance. The R15 has always been a serious performance bike and this is no different. At 815 mm, many people will find the seat difficult to use. The rear set foot pegs and low handlebars make for a crouched seating position that is meant for racing and little else. This bike cannot be used for commuting. The rigid 37 mm USD front forks and monoshock rear also have the same things to say about comfort. They do however make up for it by giving the bike excellent handling. The new more rigid Deltabox frame is complemented by a lighter and wider aluminium swing arm. The 139 kg weight makes it very easy to flick around. Turn-ins are made easy by the wide and confidence boosting tires. A 155 cc liquid-cooled and fuel injected SOHC single cylinder mated to a six-speed transmission powers this Turn-ins beast. 19 hp at 10000 rpm and 14.7 Nm of torque at 8500 rpm are at the disposal of its rider’s left hand. With variable valve actuation on board, this engine can rev higher and possesses a wide power band. Yamaha has also included improvements like better air flow through bigger valves, airbox, injectors and throttle bodies. A forged piston and Diasil cylinder keep the engine cooler. A bypass thermostat allows lower complemented times. The slipper clutch allows smoother and quicker downshifts. All these features combine to give the bike better performance at higher revs without feeling like it is going to explode. Braking has been improved with a bigger 282 mm disc brake on the front and a 220 mm disc at the rear. The brakes have enough bite for the intended purpose. However, Yamaha does not offer ABS on the bike, even as an option. At such a high price range, this decision does not seem to make a lot of sense. Yamaha has been introducing some very interesting bike recently and this might just be the most exciting of them all. Yamaha’s ardent fans should be more than satisfied with the YZF R15’s newest iteration. What are the Safety Features Available in Yamaha YZF-R15? Is Yamaha YZF-R15 available in Electric?